Review: All of the trails are hard packed and ready to be ridden. I packed down Schumacher trail with my 4.8 tires so it should be pretty easy to follow my big tire print. Park at 7th Line North and Bass Lake side road east so this way you will have access to all of the trails. Parking is on Bass lake east of 7th line. Let's try to ride all of the trails and keep them open all winter. Conditions are great. Enjoy and Happy Holidays! Review: Not all of the trails are groomed at this moment because this place is located in the snow belt but you can put in about 15 -20 km without hitting the same trails. Park at the steam whistle parking and groomed trails will be right there. Review: Just came back from a night ride and it was awesome. Lots of snow again probably about 6 inches and looks like it will stay here for a while. Go get your fat bike and enjoy this beautiful winter. This place has insane amount of trails and a real winter wonderland. 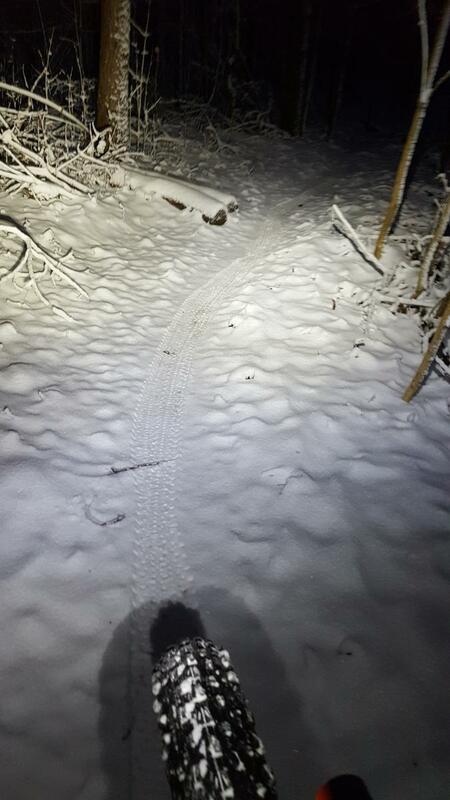 Review: Went yesterday for a first fat bike night ride. There was a good amout of snow on the trails for a perfect ride. They have probably over 60 km of singletrack so this place is perfect for somebody like me that like to do big rides. Looking forward to this fat bike season and this will be one of my go to places this winter. 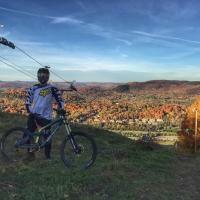 Review: Great trails! Only beef I have is seeing riders there who aren't members of SCMBC. The club is non-profit and do an awesome job at making new trails and upkeep, the least you can do is join for only $40/year. My favourite place to ride in Ontario. The new Creeks trail is world-class caliber. Lots of trails to explore ranging from easy to break out the advil. Bring water as no source at trailhead. Hope to post pics soon. Review: This place is amazing. I brought my carbon hardtail with me and it was an awesome ride. Trails are fast, flowy and very smooth. You can go very fast because you won't get tight turns or swith backs evert ten seconds how it is in many other places so you will come across alot of fast and flowy downhills. You will also come across a few steep technical uphills and some jumps so this place is a hidden treasure where everybody will have an amazing time. There is about 40-50 km of singletrack so you can put in a full day ride. The trails are marked by different colors so stick to the color you started with and it will bring you back from where you started from for the most part. You can find trail maps at Scmbc web site. Great job Scmbc. Review: Great trail system. Variety of terrain that is very well maintained. Challenging switchbacks, nice elevation change, technical. Highly recommended. 7thLine to Sugarbush - Green (Nodes D, E, F, G, H, I) MTB Trail 4.58 out of 5 based on 19 ratings. 19 user reviews.